Getting closer to the ProcessWire 3.x stable release, version 3.0.14 focuses largely on updates and optimizations specific to recent GitHub issue reports. We also have optimizations and in-depth coverage of PW's file compiler, some new options for required fields, along with a review of some best practices when working with fields. It's now Spring 2016 (Happy Spring!) so we're starting to focus on getting PW3 ready for it's stable release. As a result, we'll likely be shifting some attention away from adding new features, and more towards maximizing the stability of 3.0 in preparation for release. Most of our updates this week can be found in the devns branch commit log, and we'll also cover some of the bigger ones below. Are there any drawbacks to using compiled files? Is it worth updating template files in existing sites to avoid compilation? Is it worth updating existing modules to to avoid compilation? Fewer moving parts or more? If you are using ProcessWire 3.x, you are likely familiar with the file compiler, which compiles template files and modules to make them work in ProcessWire 3.x's namespaced environment. This enables non-namespaced code written for ProcessWire 2.x to easily work with ProcessWire 3.x. It's a good solution for the transition of no-namespace to ProcessWire namespace. In ProcessWire, compiling a file means moving it to another location (in /site/assets/cache/), making updates to it, and using the updated file rather than the original. Once ProcessWire 3.x has been out for awhile, we expect that modules and template files will be coded specifically for 3.x more and more. By that, I mean they will use namespaced PHP code. That means simply having a namespace ProcessWire; (or some other namespace if preferred) at the top of each PHP file. Once a namespace is present, it's no longer necessary for the file to be compiled in order to work with ProcessWire 3.x. ProcessWire 3.x already detects whether modules have a namespace or not. When they do, the modules are used as-is without compilation. When they don't, ProcessWire compiles the module for compatibility with 3.x. This new Auto option is our new default (for newly added templates) and it enables the compiler to be automatically disabled whenever you add a namespace to your template, should you decide to sooner or later. Likewise, if you remove the namespace, it'll start compiling your template again. Note that there are other uses for template compilation outside of just making 2.x template files compatible with 3.x, such as use of FileCompiler modules. So if you always want a compiled template then choose one of the "Yes" options rather than the "Auto" option. The file compiler also received a few optimizations this week. One of the biggest optimizations is that it is now a little bit smarter about when a file needs compilation or not. Specifically, it doesn't need to use as many compiled files as before. If it determines that the original file can still be used (even if it lacks a namespace) it will use the original file rather than the compiled version. It will still compile the file so that it can keep track of things for comparison purposes, but it will use the non-compiled source file instead of the compiled version when it is possible to do so. Since we're talking about ways to enable and disable the file compiler above, you might be wondering what are the drawbacks of file compilation. In an ideal world, we wouldn't need file compilation at all. That's because technically, it is overhead. ProcessWire has to keep track of both the source and target (compiled) files, and re-compile the source to target every time a change is made to the source file. Keeping track of what needs to be compiled and when adds a little bit of overhead, though not overhead you are ever likely to notice. Whereas the actual compilation of a file can be slow, perhaps taking up to a second to compile a single file. Thankfully, once compiled, it continues using the compiled version until it's no longer current. Meaning, compiled files shouldn't affect the performance of your site since the compiled file should execute just as fast as the original. For every compiled file, ProcessWire has to keep a hash of the source and target file contents and compare them to each other every time the file is used. This ensures a compiled file can never be of a version older than the source. It's quite fast actually, but it does add a little bit of overhead, especially if there are lots of compiled files to review on every request. In reality, I haven't yet noticed any difference in performance between sites using compiled files and those not, except when the actual files need to get compiled (which you definitely notice). But the point I'm trying to get across here is that there are more “moving parts” when the file compiler is involved. So if you are starting a new site, or building a new module, you might consider making it PW3 native by using the ProcessWire namespace in your template file(s) and/or module (or another namespace if preferred). But of course, doing so will always be optional. I'd say No, as this is exactly what the file compiler was originally intended for – to save you from having to modify your site during a PW2 to PW3 major site upgrade. ProcessWire is here to save you time, not cost you time. Though if you want to avoid compilation perhaps due to a complex application, then it's something to consider. But in my case, I've not updated templates in any of my PW2 to PW3 site upgrades, as I've not seen any reason to. But when creating new sites, I'm using the ProcessWire namespace in my template files so that compilation isn't necessary. This is for module developers. The answer is Yes and No. But for now, No, unless you are creating a brand new module. After the stable PW3 has been out for awhile and use of PW2 is less common, then I would say Yes, we'll want to update our modules to be PW3 native by using a namespace. You can do the same to disable module compilation, though we don't recommend this at present since few modules are PW3 native. If you want to disable compilation for a single template file, edit the template in Setup > Templates > your-template. Click the Advanced tab, and choose "No" or "Auto" for the "Use Compiled File?" setting. If you choose "Auto", you'll have to make sure your template has a namespace ProcessWire; at the top (or another namespace). You can disable the compiler for any module just by declaring a namespace at the top, like mentioned in the previous item. You can disable the compiler for any individual file (regardless of whether it's for a template or module) by adding the text FileCompiler=0 somewhere within it. Presumably you'd put this in a PHP comment perhaps at the top of the file, but it doesn't matter, i.e. This is why the file compiler exists. It's biggest purpose is to enable you to go about your business without caring about major version differences in your CMS. So if this is you, then you should continue using ProcessWire the way you always have. Most likely you can tune out whenever you hear the term "file compiler". Good! That means the file compiler is working correctly. Carry on. But if you do start to care, or run into any issues you aren't sure about, come back here to learn more about the options available to control the file compiler. 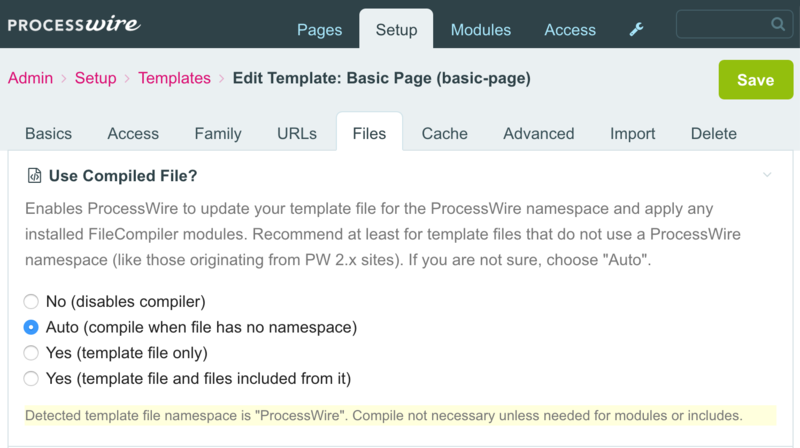 In ProcessWire, you can't publish a new page until all required fields are completed. But once that page is published, the "required" state of a field is not as strict. If a person editing intentionally makes a required field blank, it'll notify that user that they've missed something required (and continue to do so, so long as it's blank). But ProcessWire won't prevent the page from being saved, or block the edit they've made. So the required state for a field has always been more like a strong suggestion than a do-or-die rule, at least when it comes to already published pages. Why? ProcessWire's schema is always flexible. You can add new fields to existing templates at any time (optionally making them required). You can modify the settings of existing fields, perhaps making a field required that wasn't before. Basically, it's always possible for required fields to exist as blank. It's the nature of the flexibility. Avoid writing code with ProcessWire's API that assumes a field will be always populated. In most cases, the distinction may not matter. But for cases where it might matter, it's as simple as an if() statement to make sure something is there before you start building markup around it. We'll cover some examples and best practices in the next section. This is specified at the Template level because it's very likely you may prefer different behaviors depending on the template. For instance, you wouldn't want a missing required field to unpublish a top-level section of your site, but it might be perfectly fine for a product page in a large inventory of products. Note that alerting the user of the error is the only solution that will work 100% of the time. That's because there may not be a previous value to restore (as would be the case on a newly added field), or the user may not have permission to unpublish a page. So just keep that in mind as you consider these options. Also note that these new options do not relieve you of the responsibility to check that a value is populated when it comes to your own code, as blank values can exist on a Page regardless (for the reasons of flexibility stated earlier). We'll cover some best practices in this regard in the next section. When working with fields on a page in ProcessWire, it's never a good idea to assume that a given custom field is always going to have a value. Most of the time it doesn't matter that much, but in some cases it does. We'll cover some scenarios and things to consider here. If the above code executed without that if() statement, it's hardly an error – it would just display a "Photo Gallery" headline with no photos below it. If you didn't need the headline, to accompany it, you could safely skip that if() statement if you wanted to. That's because the value is always a Pageimages object/array, which can contain 0 or more values. ProcessWire gives you some useful alternatives to work with when dealing with Page fields. You have control over whether the value will be an array of pages (PageArray) or a single page. If you choose a single page, then you can also choose what the blank value would be: boolean false or a NullPage. 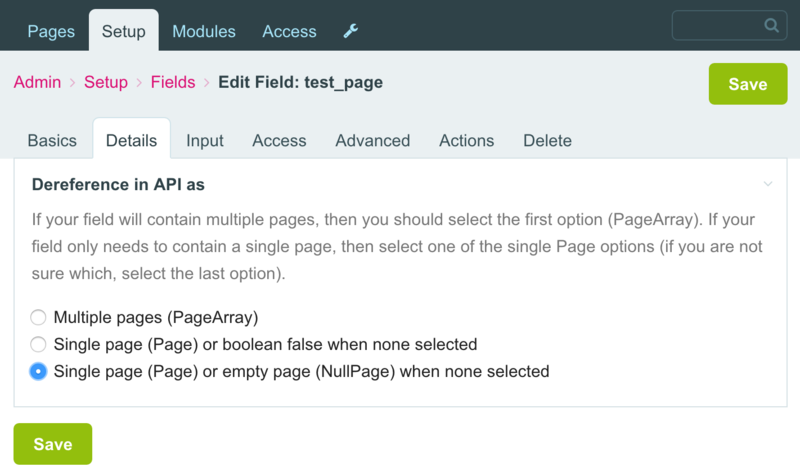 For these single item Page fields, it's safer to choose NullPage as your blank value because a NullPage is just another type of Page (with id=0) so any code written to work with a Page will also work with a NullPage. That doesn't mean you shouldn't still check that it's populated, just that doing so isn't necessarily required. But lets say that you've instead chosen "Page or boolean false" for your Page field. In that case, it's necessary to check that a value is present before treating it as a Page because trying to access an $object->property of a boolean false would be a fatal PHP error. This is just like the situation we described earlier with regard to a single Image field. In the above example, ProcessWire will try to get the "browser_title" field. If not available, it'll try to get the "headline" field. And if that's not available, it'll use the "title" field. The examples above are best practices to working with ProcessWire fields and translate to almost all ProcessWire Fieldtypes. That's all for this week! Hope that you all have a great weekend and week ahead. Remember to read the ProcessWire Weekly this weekend.